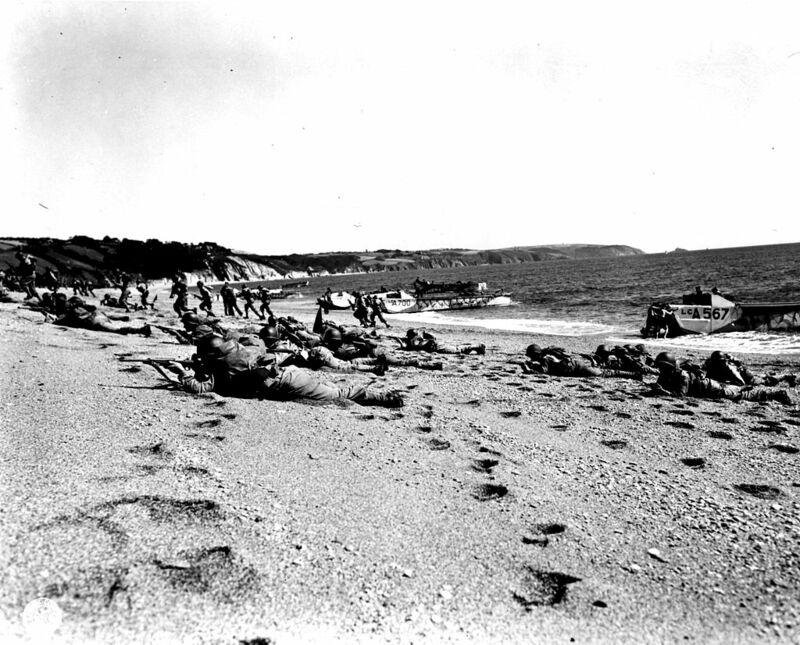 "To the north from here stretches a duney expanse called Slapton Sands, so similar to the beaches of Normandy that they used it for a dress rehearsal for D-Day in the spring of 1944. Amid great secrecy, thirty thousand American troops were loaded onto landing craft and taken out in the bay to practice coming ashore, but by chance nine German torpedo boats spotted the activity and cruised at will among then, blowing the landing craft out of the water with ease and causing all kinds of mayhem. No one from the Allied side, it appears, had thought to line up suitable protection for the exercise, so the U-boats [sic: E-boats] were able to move about unimpeded. One of those watching the carnage was Eisenhower himself. Nobody seems to know how many people died. Numbers range from 650 to 950 or so. An information board at Torcross says 749 American soldiers and sailors died. Whatever the exact figure, far more Americans were killed that night than died in the actual landing at Utah beach just over a month later. (Casualties were much higher at Omaha beach.) It was the most lopsided rout America suffered during the war, yet nobody has ever heard of it because news of the disaster was withheld, partly for purposes of morale, partly because of the general secrecy surrounding the invasion preparations. What is most extraordinary is that the Germans, having chanced upon a massive collection of boats and men engaged in training exercises just across the sea from the Cherbourg peninsula, failed to recognize that an invasion of northern France was imminent." Text excerpted from Bill Bryson's The Road to Little Dribbling. More information at Wikipedia. Will you be posting a review of Little Dribbling when you finish it? I'd be interested to hear what you think. Yup. In a couple days or so. Already done reading, just compiling my notes. Not U-boats, but E-boats. Quite a difference.